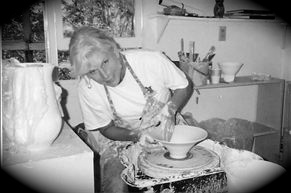 Carol Clarkson is a clay artist originally from South Carolina and now living in Montana. She was a teacher and director of the hearing impaired and learning disabled. After transitioning to a career in ceramic art, it became clear that creations in clay are no different than speaking with hands using sign language. Her hands create a visual representation of her surroundings. Carol's work has been displayed in shows and galleries in the Southeast and is currently available at Artists On Main, Ennis, Montana.